The teething cuff from OhPlah! is one of these great little ideas that are so simple, but so smart. It is a stylish cuff for moms to wear that is made from medical grade thermoplastic. This means that it is non-toxic, bacteria resistant, free of lead, latex, BPA, latex and phthalates. Wear it on your wrist and pass it off to your teething or fussy baby that needs something to chew on, twist, bend or play with to keep him or her happy and entertained. It is durable and flexible and it can easily be cleaned with soap and water. I have one myself and while Birdy isn't teething yet, I've been using it as a nursing reminder–wearing it on the wrist of whichever side I need to start on next. (with sleep-deprived mommy-brain you'd be surprised how easy it is to forget in these early days.) And know what else is great? When you are done with your teething cuff, you can visit the OhPlah! website to print out a prepaid postage sticker to return your cuff where it will be recycled by the company. We create toys that inspire children's imagination as well as promote their phyical and intellectual development. We're also proving that it is possible to maintain superior quality standards while steadfastly following a path of environmental and social responsibility. 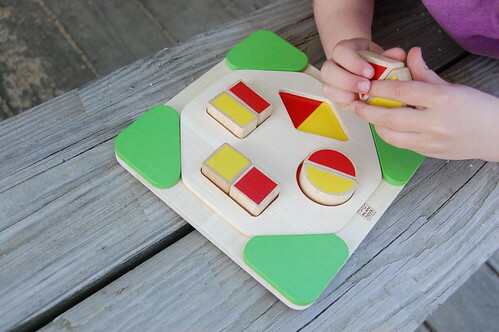 We were recently sent this wooden matching game to review as part of Plan Toys new Spring line. It usually sits at our kitchen table and the girls play with it often. Sorting. Matching. Thinking. Another classic added to our collection. When I first became pregnant with Emma, I remember going through moments of worry and fear about the journey ahead. Was I ready to be a mother? Was it too soon? How would I figure it all out? How would I know what to do? And I can remember during many of those moments of concern, flipping through the pages of a Martha Stewart Baby magazine. Getting lost in the pages, I felt reassured and inspired. I felt like I could do this. I believe that magazines can serve a variety of roles in our lives. They can inspire, educate and encourage us, and help us find camaraderie and connection. Or they can can make us feel inadequate, ill-equipped, or lacking. Mothering celebrates the experience of parenthood as worthy of one's best efforts and fosters awareness of the immense importance and value of parenthood and family life in the development of the full human potential…We address contemporary health, personal, environmental, medical, and lifestyle issues in an upbeat, intelligent, compassionate, and courageous way…Each issue contains philosophical inspiration and practical advice about family living…Mothering is a family. We have an independent editorial spirit unmatched in the industry and a readership that is unmatched in responsiveness. Readers who read Mothering share many of the same values. Nowhere else will you find such proactive, passionate, and highly educated readers. In the pages of Mothering you will find an environment of credibility, trust, and authority. Thanks to the generous friends at Mothering magazine, one lucky MommyCoddle reader will win a ONE YEAR SUBSCRIPTION to MOTHERING magazine. Simply leave a comment on this post to be entered. The winner will be announced on Monday, May 3rd. I'll be back later this afternoon with one more GRAND FINALE giveaway! I’ve been reading Mothering at the library, but would love to do it at home! What a wonderful giveaway! I would love to win! Great toy picks — we have another little one on the way and will be adding those to our “to buy” list!! Love Mothering magazine — it would be great to get a sub! would love a mag sub! the teething cuff is genius! and stylish to boot. love plan toys– they are a staple in our household too. wow, great reviews and giveaway! thank you so much! I’ve seen Mothering around and would love to have my own subscription. Magazines about a subject dear to my heart are so fun – especially in the quiet evenings at the end of the day! Love the cuff! and love Mothering mag! Thanks for sharing all these goodies! I love mothering mag. I read it at the birth center where we have playgroup. Would be great to read it at home. 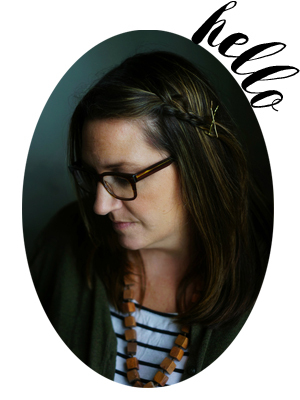 I’ve heard SUCH wonderful things about Mothering, here and on other blogs. I would love the chance to read it! Thank you to you and Mothering for the giveaway! I’ve been wanting to check out Mothering magazine. Oh I would love to win this! I love Mothering and my subscription has run out! awesome stuff! the teething cuff is BRILLIANT and my Mothering subscription needs to be renewed! I have never heard of Mothering magazine but as mother of 3 I could definitely use it. Thanks. fun! We ADORE plan toys here. and mothering would be great to have! I’m not a mother yet, but hoping some day soon that will change. Would love this subscription! Love the teething cuff and have always been trying to get people to buy my kids plan toys. Mothering is a great magazine! I have been meaning to subscribe and haven’t gotten around to it so I would love to win! Have always loved Mothering but haven’t looked at it in a few years, would love to pick it up again now that my kids are preschoolers. I love that teething bracelet! I may have to get a few. Love all of the wonderful ideas on this blog! Mothering magazine would be a welcome addition in this house! That teething thing is awesome. And we love Plan Toys at our house! Mothering is such a great magazine. I’d love a yearly subscription. I love to get new magazines in the mail. This one would be great! I’ve enjoyed reading Mothering at my local library, but I’d love my own subscription! That teething cuff is a great idea! I LOVE Mothering magazine! It has encouraged and inspired me through the last couple of years. have heard of mothering magazine before and wanted to try it….thanks for reminding me! We love plan toys at our house and Mothering mag. would be a nice addition. Due in August, so this would be amazing! LOVE LOVE LOVE Mothering magazine. Now I just need a few quiet moments to actually read it. Thanks for the info on the toys. I have been looking for NON “plasticky” toys. Oh my! Those teething cuffs sound like a great idea! I heard good things about that magazine. I would love a chance to win it. I am feeling all of those things right now as I’m pregnant for the first time. aw my girls are always trying to eat my jewelry, what a great magazine giveaway, 2! yeah! Oh I adore Mothering Magazine! What a wonderful giveaway. Plan toys and Mothering are two of my all time faves! As a first time mom, this magazine would be wonderful! thanks for all the great suggestions. I would love to have a read of mothering magazine. i don’t know if I missed my chance this weekend, I was out and about with the family but I would love a subscription to this wonderful mag. Thanks for the chance! his magazine is very hard to find around here. i would love the chance to win a subscription! Would love to play with those toys.